The function of a Load Balancer, also known as an application-delivery controller (ADCs) is to distribute workloads to back-end servers in order to ensure optimum use of overall server capacity and improve application performance. Whether applications remain in Enterprise data centers or are shifted into the cloud, server load balancing remains a key element and continues to be broadly deployed for workload distribution across server farms. Scalability and high availability are two of the main drivers for load balancing, they provide the key capabilities, namely adapting to changes in demand without impacting performance and maintaining availability during downtime of one or more servers. If a server does go down, the load balancer reroutes traffic to another server. Conversely the load balancer can add or subtract servers depending on demand. Essentially, service providers and enterprise both rely on load-balancing and ADCs for traffic distribution and to maintain highly available services. In scenarios where businesses need to move to more than one data center either for disaster recovery reasons or regulatory due to country privacy laws, Global Load Balancing is required to move traffic between multiple data centers. According to Grand View Research, Inc the global Application Delivery Controller (ADC) market is expected to reach USD 4.34 billion by 2024. The research firm anticipates high growth over the period due to the increasing globalization and distributed enterprise architecture, which requires networks that can deliver their business-critical applications faster, thereby ensuring security. The increase in the data center traffic and the growing ADC popularity, particularly in the consolidated data center segment, are expected to be the major factors spurring ADC market growth. GVR note that the increasing adoption of the BYOD phenomenon has led to the widespread usage of tablets and smartphones particularly in large organizations as it significantly increases the scope and span of enterprises. This, in turn, has resulted in a rise in the ADC demand in order to balance and maintain the server load. In addition, emerging technologies, such as software-defined storage (SDS) and software-defined networking (SDN), are also anticipated to spur the ADC market growth over the coming years. Load balancer performance requirements continue to grow as the range of functionality increases. Typical functions that an ADC must perform include dynamic L4-7 redirection, load balancing and failover, and support for big data use cases. SSL termination, data compression and dynamic/adaptive compression as well as protocol optimization are required to meet performance requirements while WAF, network-level security functions, DDoS protection and server cloaking are functions required for increased security. 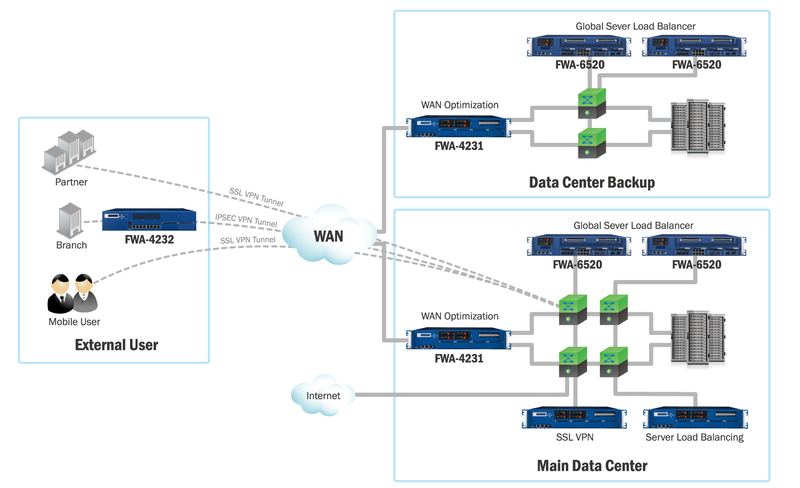 Advantech’s FWA-6520 series is an ideal platform to meet high performance load balancing needs. It is designed for maximum performance, scalability and functionality in a 2U rack mount footprint. This dual processor-based, high-end network appliance is optimized to balance compute performance with high speed, high density I/O and best-in-class energy efficiency. Two Intel® Xeon® Processor E5-2600 v4 CPU large on-chip cache memories and two Intel® QuickPath Interconnects running at up to 9.6GT/s for reduced cross-socket memory latencies and increased throughput. Each socket supports 4 DDR4 channels at up to 2133 MHz for a maximum of 512GB of ECC memory using RDIMM technology. Advanced RAS modes such as mirroring and sparing increase platform reliability. The platform’s advanced thermal system design enables support for processors with 135W TDP on standard SKUs and up to 145W on special SKUs available via Advantech’s Customized COTS framework. This allows the appliance to scale from 8 to 22 core CPUs. With 80 PCIe Express lanes, the FWA-6520 can support up to 8 Network Mezzanine Cards (NMCs) for modular, configurable networking I/O and acceleration. PCIe gen3 technology on all NMC slots provides sufficient bandwidth to support multiple 40GbE and quad 10GbE modules. The platform also supportq double sized NMCs for 100GbE connectivity. Advanced Lights Out Management based on Aspeed’s iBMC AST2400 and AMI’s MegaRAC IPMI suite improves system manageability and reliability, providing platform thermal management, H/W monitoring and supervision. Remote firmware upgrade capability and hardware-based BIOS redundancy make the FWA-6520 an ideal platform for mission-critical and highly available networks. Front and rear hot swappable FRUs such as power and fan modules along with service friendly design features such as fan failure LEDs further help to reduce system down time and enhance serviceability. Support for standard two PCI Express expansion slots and a TPM(Trusted Platform Module) for enhanced platform security round off the feature set of this platform. Management and IO elements include two management Ethernet ports, a console port, two USB ports, a LCD module, LEDs for power/locate/alert indication and two front-loadable 2.5” SATA HDDs/SSDs.